Are you a stressed out bridesmaid battling multiple Whatsapp groups and a whole load of personalities trying to organise your besties dream hen do on a budget? Then why not head to Cardiff and get crafty with Twin Made? Our calendar is now open and we are taking bookings from June through until August. We can cater for all ages and crafty abilities and have a lovely colourful studio to host the party or we can even come to you! If you love poms poms, bright colours, tassels, glitter, sewing, fun and knickers - this is for you! Charlotte and Kathryn were amazing hosts, really helpful, enthusiastic, attentive and up for fun! No idea was too silly, which is perfect. Everyone had a great time, we brought our own Prosecco and cake If you want to do something that’s really fun, flexible and out of the ordinary then I cannot recommend it more! Our Crafter-Parties start at just £15 per person. Never been to Cardiff? Do not worry we can help with accommodation, best places to eat and where to carry on the party. Any of of our existing workshops can be offered, but below are just a few more ideas. Macrame Plant Hangers - learn the retro art of knots to create fabulous and colourful plant hangers - why not use the hangers to decorate the wedding venue! Bountiful Bunting - come create bunting for the wedding! A perfect way to make decorations and you can even personalise! Keepsake Quilt - A perfect keepsake, each member of the party stitches up a square and we turn it into a beautiful quilt for you! Stitch Before your Hitch - Decorate a pair of knickers with lots of pretty things, ready for a night out in Cardiff. Perfect for a mixed sewing ability hen do. No good at sewing? No problem, we have lots of iron-on decorations. 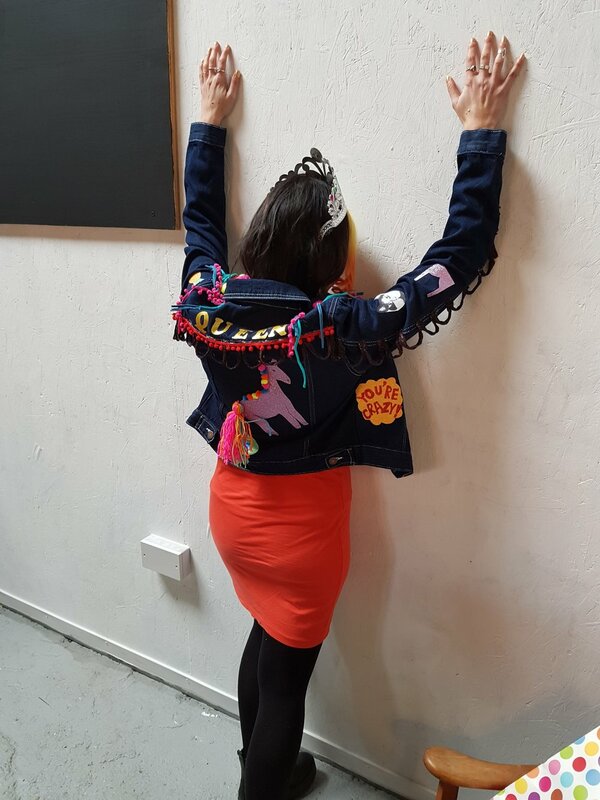 We also have an added extra, for just £30, as the party craft the group can decorate a jacket for the Bride-to-Be to wear that evening and keep as a colourful memento from her fabulous hen do! Email us now to start creating your party!